The term Naxalite refers to various militant Communist groups operating in different parts of India, under different leaders, as separate organizational groups. Other terms used are Naxalvadi (Hindi) and Naxal. The terms originate from the name of the place where the movement was originally started, the village of Naxalbari in West Bengal. A sub group of the Naxalites that operates in the North Eastern states like Orissa, Jharkhand, West Bengal and Chhattisgarh refer to themselves as Maoists. The Naxals are radical communists and followers of Maoist political sentiment. Their origin can be traced to the split of the Communist Party of India, back in the year 1967. The split caused the party members who believed in the Maoist ideology to separate themselves from the Communist Party of India. While the movement initially had its roots in West Bengal, over the years it has spread into other states, into the under developed rural areas, or Southern and Eastern India. This has happened mainly due to the activities of illegal underground groups. In the past decade it has been bolstered as many tribals who have been displaced from their lands joined the movement in order to fight against what they perceive as corrupt corporations and local officials out to exploit them. It all started on the 18th of May 1967 when Kanu Sanyal initiated a movement promoting the use of armed struggle to redistribute land to the land-less. In the following weeks a police team that had come to arrest some peasant leaders was ambushed by a Jangal Santhal, another prominent leader of the movement, with the help of some tribals. Encouraged by this event, in the coming days many poor people and Santhal tribals joined the movement and started attacking small local land-lords. Over the years the movement got broken up into disputing factions but did not die out. Even some urban elites like Charu Majumdar were attracted to the ideology. However what was common amongst all these people was that they were following Mao Zedong's ideological leadership that the Indian peasant and tribal classes should rise and over throw the government and the upper class by force. The government responded to this movement with strong counter measures. 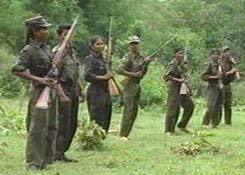 The West Bengal Police fought hard to stop the Naxalites. Naxal students from the Calcutta University and the Presidency College were incarcerated and allegedly tortured. None of this however, could decisively stop the movement. In the middle of the last decade Research and Analysis Wing of India estimated that around twenty thousand armed Naxalites were operating along with up to another fifty thousand unarmed regular cadres and that their influence was continually growing. This has led to the Naxalite movement being labeled as the most serious threat of the internal security of our nation. Today, while some of the Naxalite groups have changed their path to becoming legal organizations, many militant groups still exist and are at large, committing atrocities like terror attacks against innocents. According to some statistical data more than one thousand deaths occurred due to this in the year 2010 alone : two hundred and seventy security forces, two hundred and eighty Naxals and more than six hundred civilians. The 2011 toll was lower, but still considerable in its size, at nearly four hundred and fifty civilian and nearly one hundred and fifty security personnel. One of the worst Naxal attacks took place in 2010, when Maoist rebels ambushed and wiped out seventy four paramilitary personnel and two policemen in two separate, well coordinated attacks, carried out by over one thousand rebels. Besides those who died, at least fifty other security personnel were injured. These attacks took place in the remote jungles of the Dantewada district of Chhattisgarh state. However despite all these attacks and attempts to terrorize the populace the Naxals have not been very successful in their original aim. India's security forces are fighting back hard against these militants, making sure that they are unable to sow discord in our otherwise harmonious nation. Go Back to India for more.